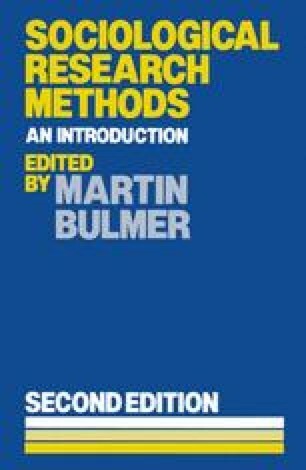 Introduction: Problems, Theories and Methods in Sociology — (How) Do They Interrelate? What constitutes sociological knowledge? This question has lain at the heart of discussions about sociological inquiry ever since Durkheim’s classic The Rules of Sociological Method was published in 1895. How it is answered has implications for sociology’s status as a scientific or humanistic discipline, for the activity of sociology itself, and for the explanatory power (and ultimately the effectiveness in the real world) of sociological propositions. Succeeding generations of sociologists have argued out, analysed and re-analysed the problems which it raises, and proposed new solutions to them. However one regards The Rules as an account of the logic of social inquiry, it is a landmark in the history of sociological methodology and a reference point for all subsequent debates. The attempt in it to weld empirical inquiry to theoretical concerns, and to illuminate and test theoretical propositions by confrontations with empirical data, provides a model for disciplined sociological work which is still pertinent today. Its significance lies above all in the guidance it provides for the conduct of empirical sociology, emphasising both theoretical and empirical elements and their necessary interconnection. As a methodological statement, it sharply demarcates empirical descriptive work (sociography) from empirical-theoretical work (sociology). Consider social facts as things (E. Durkheim). Sociology is a science which attempts the interpretive understanding of social action in order thereby to arrive at a causal explanation of its course and effects (M. Weber). Society does indeed possess objective facticity. And society is indeed built up by activity that expresses subjective meaning. It is precisely the dual character of society in terms of objective facticity and subjective meaning that makes its reality sui generis (P. Berger and T. Luckmann).